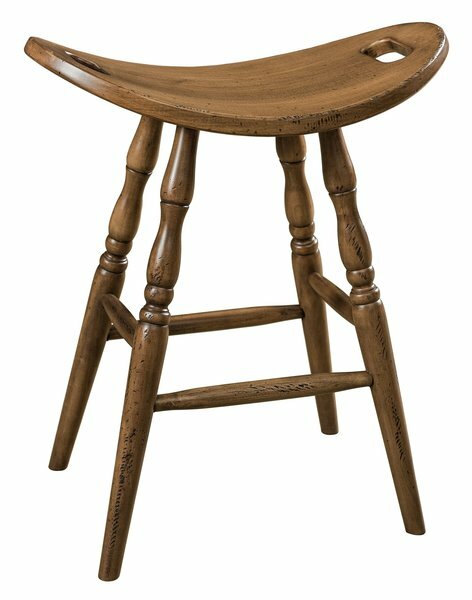 Add a unique flair to your living or dining space with the custom made, country style of the Amish Saddle Bar Stool. Each contoured seat provides a comfy sit at the counter, bar or kitchen island. Enjoy the company of family and friends as you gather for drinks or a casual dinner at the kitchen bar. This country furniture offers that simple design with a homey feel wrapped around it! Sit up to the counter in the saddle seat with lovely bar stool legs that are available in either a decorative or plain style. The Saddle Bar Stool is shown here in oak wood with medium stain. Oak wood is known for creating a warm ambiance in any room. Take a look at all the uses for custom made bar stools in your home. In the Kitchen: Line the counter or bar with the saddle bar stools or place them around your kitchen island. In the Bedroom: Place a saddle bar stool in front of your dresser mirror to create an instant vanity.